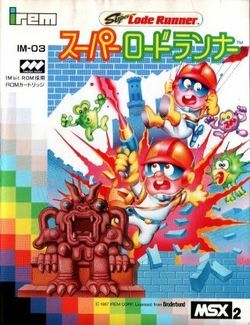 After Irem released four different versions of Lode Runner for the Arcade from 1984 to 1986, they decided to bring some of the levels from the arcade versions home. Although it shares the same name as the version of Lode Runner which was released for the Famicom Disk System, Super Load Runner for the MSX2 contains a different set of levels. The MSX version contains an animated title screen that is very similar to the fourth arcade release, and it contains 33 single player levels as well as 18 two player cooperative levels, all selected from the four various arcade versions. Although the graphics were shrunk down so that the entire screen could fit within the resolution of the MSX2 without scrolling, the graphics are a little more faithful to the arcade version than the FDS versions. This page was last edited on 4 April 2016, at 21:50.